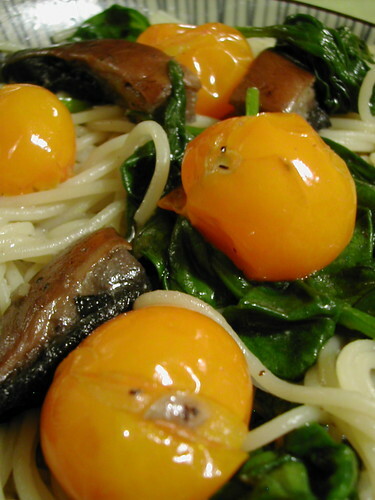 Cherry tomatoes and stringy pasta are my favourite quick dinner standby. While cooking up whatever dried pasta you have in, heat up a small amount of olive oil in a pan, add the toms, brown them, allowing some of them to burst, and mix in the pasta. Enjoy this highly unhealthy meal with a glass of vino. This entry was posted in akatsuki eats and tagged cherry tomatoes useful for dining emergencies. Bookmark the permalink.